Starting from Feb 1st 2018, DPiTH Models will be discontinued. As a possible substitute, please check out the ITHX-SD Series for details. At the same time, we will keep the CNiTH Models. 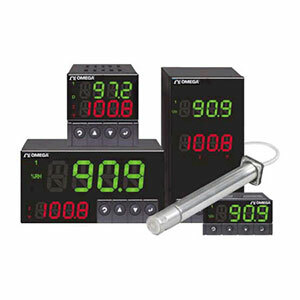 The OMEGA™ iTH Series instruments monitor and control both temperature and relative humidity. All controllers in the series are high quality, highly accurate instruments featuring Omega’s award-winning iSeries technology, uncompromising accuracy, backed by an extended 5-year warranty. With two full channels of PID control, these instruments are the perfect choice for environmental control applications such as test chambers, clinical storage, computer rooms, etc. The iTH Series Controllers provide single output control for humidity and temperature and are easily programmed for any control or alarming requirement from simple on-off to full autotune PID control. The iTH family controllers are available in four true DIN sizes: the ultra compact 1/32 DIN; the popular midsize 1/16 DIN square bezel with dual display; the 1/8 DIN vertical, and the 1/8 DIN horizontal with the big bright 21 mm digits. The iTH controller models offer a choice of 2 control or alarm outputs in almost any combination: solid state relays (SSR); form “C” SPDT (single pole double throw) relays; pulsed 10 Vdc output for use with an external SSR; or analog output selectable for control or retransmission of the process value. The iTH Series controllers are designed for easy integration with popular industrial automation, data acquisition and control programs as well as Microsoft Visual Basic and Excel. Omega provides free configuration software which makes it fast and easy to get up and running. Available for download on the Web. * Note: Extended temperature range is for industrial probe only, the controller’s operating temperature is 0 to 50°C. Replacement Industrial 51mm (2") Probe with stripped wire leads and NIST traceable calibration certificate. 3 humidity points of 25%, 50%, 75%, one temp. at 25°C. Replacement Industrial 137mm (5") Probe with stripped wire leads and NIST traceable calibration certificate. 3 humidity points of 25%, 50%, 75%, one temp. at 25°C. 2. "-C4EIT" or "-EIT" option is not available on the 1/32 DIN. Refer to the iServer section for other Ethernet devices that can connect to a CNiTH-i32xx-x-C24.